This desk seems highly overrated based on my evaluation of the product. As you know, NotSitting.com reviews are based on my use of the product and a set of consistent evaluation criteria. In this more consistent and technical review the X Elite did not perform well. The highlight of the desk is it’s stability. 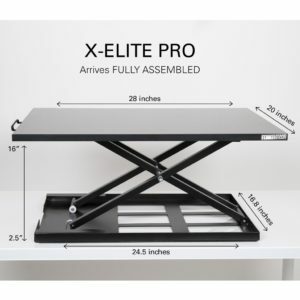 It is incredibly stable when extended at max height due to its black metal frame that is almost the same size as the desktop and the crossing design of the supports. I’ve not used a more stable sit stand desk-topper desk than this one. Another standout feature is the size of the workspace. It is far greater than most of it’s competitors. There is plenty of room for a 17 inch laptop, phone, Kindle Fire, and the miscelaneous items that collect on a desk. It’s challenges are significant however. First, it does not drop down low enough to be ergonomically correct for the hand position while sitting. As a result I have to remove the keyboard and mouse from the desk and place it on my desktop while seated. This also means that it is positioned about 7 inches back from the front of my desk so that I have enough room for the Microsoft ergonomic keyboard and trackball mouse that I use. This causes a secondary problem when I move the desk to the standing position. Now I have to slightly extend my arms to get to the keyboard and mouse… not good ergonomics. Continuing on ergonomics, you’ll need to boost a monitor up if you use one since a flat desk with monitor is does not fit good ergonomics while seated or standing. Next, the movement up and down takes a lot of getting used to. You have to apply just the right amount of pressure up or down to get the right result and it is not forgiving. While writing this review I chose to change to the sitting position and messed up the pressure and it slammed down. This is after two weeks of straight use, so it’s not a new-user error. This coupled with the height while in the lowest position result in the two start review for Experience. From an aesthetics standpoint the desk is black, rectangular, and plain. It will fit nicely into a lot of environments and I would consider the look to be typical or average for this sort of product. Overall, I do not recommend this product unless you can lower your desk or raise your chair for proper ergonomics. The most unique feature of this desk is the hydraulic air compressor that assists with the movement. It is tricky to get used to however and if you change the weight on the desk you change the amount of force you need to apply to move up and down. As I’ve mentioned, this desk has a significant amount of space on the desktop allowing for multiple monitors and other items on the desk if you choose. Be mindful of the weight limit however. 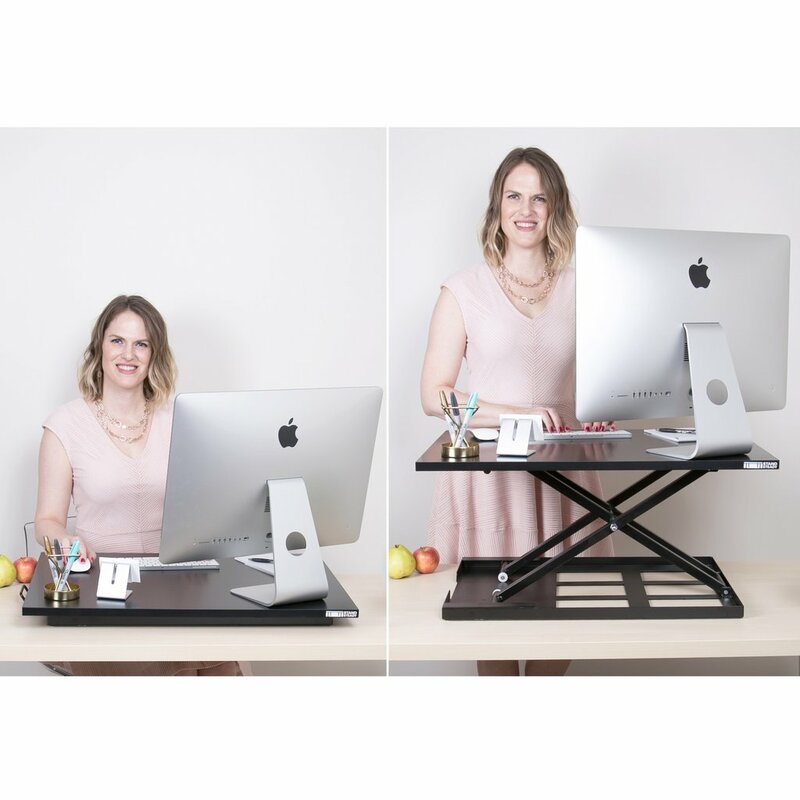 Thank you to Stand Steady for providing the desk so that we could review it based on actual use.